On February 14, Anne Howard Shaw’s Day is celebrated after the leader of the women’s suffrage movement in the United States. Coincidentally, it is also the same day where the feast of St. Valentine is celebrated in numerous countries around the world to pay respects to the martyrdom of many Christian figures that were named Valentine, such as Valentine of Rome and Valentine of Terni, just to name a few. “Lemon there is a word, a once special word, that’s been tragically co-opted by the Romance Industrial Complex, and I would hate to use it here and have you think that I am suggesting any kind of romantic sentiment, let alone an invitation to scale bone mountain. Ever since video game’s dawn, stories about damsels and heroes (and in more recent cases heroines) have flooded our screens, and more often than not there’s a plot involving some kind of romance. From Mario to Snake almost all of our favorite heroes have gone through some twisted love story. And well… whether you’re a Liz Lemon or the random stranger who just made you read Jack Donaghy’s 30 Rock finale monologue, you’d spend hours and hours trying to justifying that Valentine’s Day has no place in your life. Be it because you blame it on corporate America of killing the true meaning of the martyrs who gave their life to Christianity, or simply because you don’t have anyone to spend the day with and thus that has made you become a grumpy old human, just like me. Rhythm Heaven Fever is a rhythm video game in which the objective is pretty simple, follow the audio and visual cues to keep up with each song’s beat. Sounds simple, and it should be, but the game is infamous for begin harsh on the player’s performance of said songs. Love Rap is culpable of this and much more. A boring rhythm and vapid lyrics can’t save the song from it’s impending room… not to mention the incredibly mundane visuals. Thankfully there is Love Rap ver. 2, a jazzier more upbeat iteration of the original song, which can be played much later in the game as one of the end game extra challenges. Yet there is another game quirkier than Rhythm Heaven, and that one is Animal Crossing. How I love you and your peculiar characters. I love how Pete the Mailman is always daydreaming about Phyllis, a snotty Pelican who works at the post office, and by work I mean being rude to everyone. Phyllis should not be confused with Pelly her younger sister who is actually a likable animal and appreciates the efforts of the villager to make the town a better place. I like to think that K.K. Slider came up with this song after Pete asked him to write a song to express his love for the snotty pelican, and thus the word got spread out that Pete and Phyllis were in cahoots during Animal Crossing: Wild World… said rumors are (sadly) debunked in later iterations of the game. But when it comes to rhythm games, PaRappa the Rapper takes the (seafood) cake. The story here is pretty simple, you help a rapping dog named Parappa, conquer the challenges that stand between him and his crush, Sunny Funny, a flower who is the daughter of a Plant Pot named General Potter. The predicament here is that although Sunny Funny likes Parappa she does not appear to be interested in him unless he’s showing his more manlier side, like that time he needed to go to the bathroom. To make everything more complicated the superfly Joe Chin, a golden retriever with a bodacious chin, is always getting in the way of these two lovebirds. Eventually after learning how to Kung Fu from Chop Chop Master Onion and how to drive under the tutelage of Instructor Mussolini, Sunny Funny starts to take notice on the changes that Parappa has gone through and finally acknowledges that she also has feelings for him… in the second game of the series. Now I know what you’re thinking... of all the Tales games out there, I had to pick up the worst one of them all. Well, apart from Tales of Destiny 2, which was a JP release only, no other game in the series has actually acknowledge a relationship between its protagonists. Usually they treat “love” as something sweet and innocent, but most games in the series shy away from explicitly showing that two characters are together or have feelings for each other. 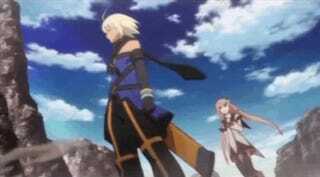 And even though Dawn of the New World never shows the kissing scene between Emil and Marta, they at least confess the love for each other in a touching moment under the night sky of Altamira. The famous adventure game from Tim Schafer tells the journey of Manny Calavera, an agent of the Office of Tourism of the Land of the Dead. I remember when I first played this game, how it struck me odd the implementation of the Mexican culture into a noir detective story. It was weird back in 1998, and it is still weird by today’s standards, but my wild suspicions as a kid didn’t derail me from enjoying Grim Fandango. Manny and Meche is a fitting song for Manuel Calavera and Mercedes Colomar tumultuous story in Grim Fandango, there’s no better way to express tragedy than with a classic Tango tune full of melodies soaring in a sea of melancholy and uncertainty. I’m not going to lie, I intended to include Hatoful Boyfriend as a joke in this list, I mean, it is a Visual Novel game with Pigeons as the main love interest for crying out loud! But after going through the game, well...l I had to reconsider my take on these birds and everything that the muti-arching plot implies. Woof (or should I say coo…)! was I taken by surprise, I mean once you get over that the pigeons are just a fluffy façade for much much darker game. All this and I never mentioned how awesome the soundtrack really is! From Jazz to Classic, upbeat and even sombre, the game’s music boast a vast array of genres and all songs are just… I can’t even! Don’t take my word, go play the game, I never knew I’d shed a tear for a dove until I played Hatoful Boyfriend. Doves are fun, but saving the the world while having a huge array of potential waifus and husbandos is even better! Fire Emblem Awakening is simply the best dating simulator ever created, there I said it, some people hate me for admitting that the relationships were the aspect of the game I liked the most. Not the story, not the battles, but creating bonds between my avatar and the other characters was the reason I kept coming going back to Fire Emblem. I got to a point in the game where I had reached the S rank with all the characters and I just simply hesitated to pick a husband or a wife (yes I played the game twice), after all you only get one shot to listen to all these glorious confessions. Link and Zelda are more than just the Hero and The Princess. The game doesn’t waste our time letting us know that these two have a “more than just friends” relationship. Link is a well known figure in Skyloft, infamous for being an oaf and absentminded, and Zelda well... she’s just a girl in a floating island, and a lifelong friend of Link who is constantly pushing him (figuratively and literally) to become a better person. But wait... if the story of a romance between a sapient bird and a human doesn’t struck you odd, then the union between a Blue Hedgehog and the princess of Soleanna will. Not only Sonic ‘06 was a technical mess, script-wise it was a disaster. It is not the fact that Sonic and Elise kiss, heck I really don’t even care about these two being together, but the fact that every single moment between these two felt so forced, the game made an awkward union even more awkward. It is obvious that the main theme for Snake Eater is about a girl who’s into a guy that eat snakes for a living. MGS3 is the best Bond game that has come out since Goldeneye for the Nintendo 64, coincidentally, Snake Eater is also better than any Bond Movie with Pierce Brosnan as a protagonist. And Hideo Kojima is a genius for creating such masterpiece. Also for slipping in a ridiculous amount of gratuitous cleavage into the game. Joking aside, Snake and EVA’s story is one of the few romances in video game that I immediately felt hooked to. It wasn’t there just for the sake of including a romantic subplot, unlike Jack and Rose in MGS2, who even though they were already in a formal relationship, were the most annoying couple to come out of Kojima’s gorgeous brain. That was until I remembered the tragic story of Salsa the Monkey from Mother 3. Fassad, a mysterious and fetid man who acts as the emissary of the Pigmask Army, has kidnapped Salsa’s girlfriend who I should mention is also a monkey (thanks Sonic ‘06 for forcing me to disclaim that Samba is also a Monkey), and is holding her as ransom in exchange of Salsa’s services. During the third chapter of Mother 3, Salsa has to battle monsters, entertain the villagers of Tazmily as the Peddler gives his speech and even deliver the impending doom of the inhabitants of the village… all in the name of love. Even without a translation of the original Japanese lyrics, Suteki da ne croons longing in its notes that delivers a certain sound of sadness. There have been many love stories in the Final Fantasy series, each with a dedicated song for its tragic love affairs or conscious couplings. But it’s Final Fantasy X’s iconic, quiet blue lagoon with stars nestled and twinkling on its reflective surface — ushered in by Suteki da ne’s calming nature followed by moving violins that sets the tone for fleeting happiness amidst turmoil experienced (and unknown troubles yet to come) by its two main characters. Catherine… Umm, Catherine deserves to be placed in a category of its own. On one hand it is a frustrating puzzle game, on the other it is a game with a deep and mature story. In Vincent we have a reproachable protagonist, yet for some reason there’s a small part of us that feel identified with him. Should you try and explore more the options with Catherine or should you conquer your fears and demons to decide to stay with Katherine...Or how about neither? With each decision taken in the game we discover a bit more about Vincent, and to some extension we learn a bit about ourselves. Catherine is a journey of self discovery, not only for Vincent but for the player controlling the game from the other side of the screen. Let them flow... let the tears flow. It’s funny how can a small event can change our perception of a character who has always kept his cool and behaved like a true gentleman throughout his life. 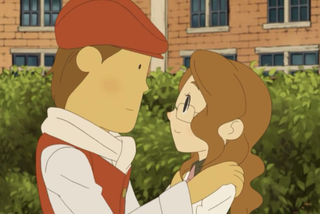 And yet here I am talking about Hershel Layton as if he was an old acquaintance of mine... as if I shared all these adventures with him during these past seven years. ...I felt Hershel’s pain as if it was my own. Happy Valentine’s Day to those who have a special someone, and to those who don’t… well just embrace the day with an open mind and remember there’s always cheap candy the day after Valentine’s Day! Hopefully you’ll enjoy this list as much as I did while writing it, but in the case you didn’t and were looking for a different kind of list, you should check this one crafted by Z. River Sang and Kafeiryas, but let me warn you, you will never escape the Sanic. If there’s a song that I missed don’t hesitate to let me know in the comments section below. Follow Nach on Twitter @Nach212 He may not tweet much, but when he does he may or may not have something interesting to say.